Seattle, WA : YWAM, 2004. Lone American Lillian Trasher founded Egypt&apos;s first orphanage in the midst of poverty, war, and deadly epidemics with no visible support except her trust in God. 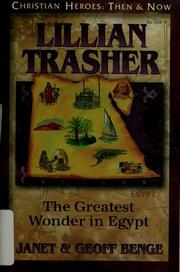 Lillian Trasher: The Greatest Wonder in Egypt / Geoff Benge and Janet Benge. 520 Summary Etc. $a Summary, etc. note Lone American Lillian Trasher founded Egypt&apos;s first orphanage in the midst of poverty, war, and deadly epidemics with no visible support except her trust in God.